Rhino Linings Corporation now offers GeoTech CC2TB, an advanced exterior trench breaker and geotechnical spray foam. 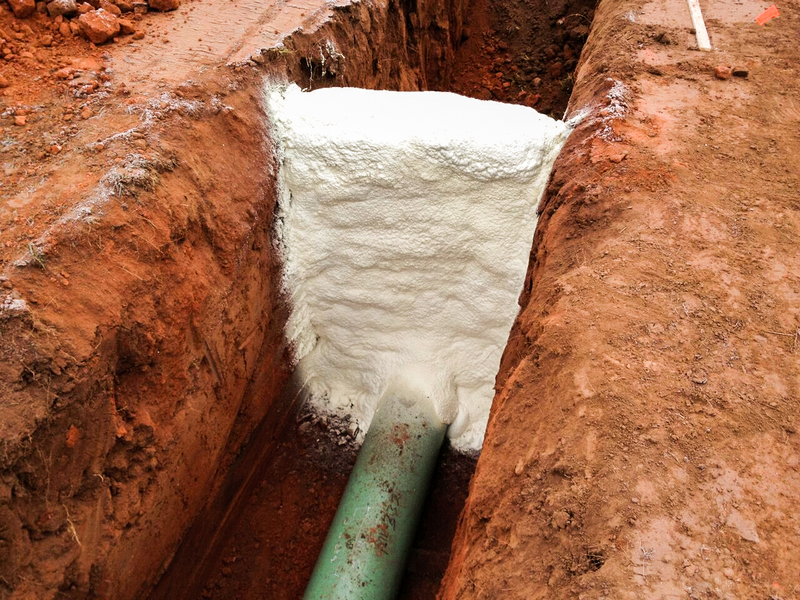 GeoTech CC2TB is a highly stable, closed-celled, water-blown spray polyurethane foam system designed for exterior ditch breaker, soil stabilization and geotechnical applications that require high compressive strength and low exothermic reaction temperatures. When applied, GeoTech CC2TB expands approximately 30x in seconds and maintains dimensional stability in a variety of environmental conditions. 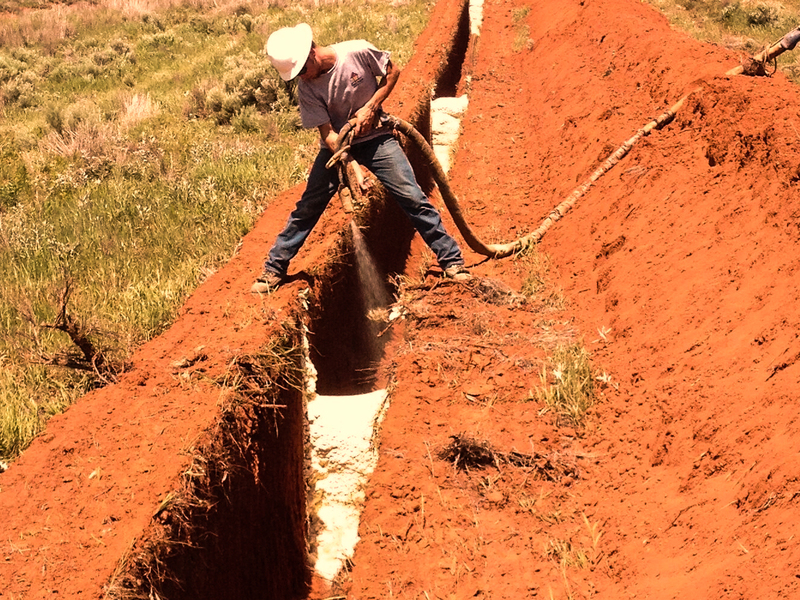 GeoTech CC2TB utilizes advanced, proprietary chemistry that lowers the product’s exothermic reaction temperature during installation, allowing contractors to apply in one continuous spray lift of well beyond 4″ without combustion. GeoTech CC2TB cures quickly, forming a thick, tough skin almost immediately so contractors are able to install successive lifts without significant foam blowout or pooling. Because GeoTech CC2TB is water blown, contractors are able to preheat or recirculate without causing damage or material loss. 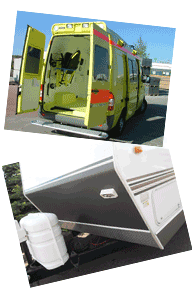 Please find the most current technical information on www.rhinoapplicators.com. Click on links to download GeoTech Data Sheet : GeoTech Part A SDS : GeoTech Part B SDS. 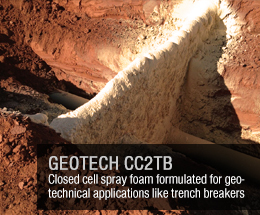 GeoTech CC2TB top-performing trench breaker foam is competitively priced. 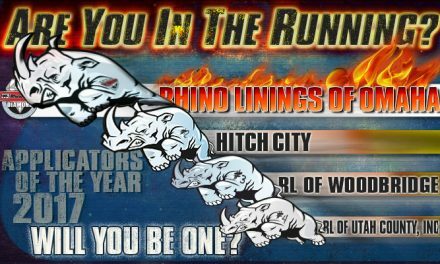 Request a quote by calling or emailing your Rhino representative.